When you have your blood tested as part of a routine medical screening or as a way of detecting a possible illness or imbalance in your body, your levels of a variety of parameters (cholesterol, liver enzymes, red blood cells, white blood cells, thyroid hormone, testosterone, estrogen, blood urea nitrogen, creatinine, and others, depending on what labwork your doctor ordered) are measured against the results from every other person who submitted bloodwork to that lab. As long as your test results are in the average range for the rest of the population, you will be considered healthy. However, what's healthy for the average population as a whole is not reflective of what is optimal for YOU. You may have some very real chronic symptoms, even though your blood tests all appear "normal." In contrast, you may feel like you are in the best health of your life, while your doctor tries to tell you that you are sick because some of your blood tests were outside the normal range. For instance, if the average level for thyroid stimulating hormone among the population tested by your lab was between 1.9 and 7.4, and your thyroid stimulating hormone tests as 7.4, your thyroid stimulating hormone will be considered normal and your doctor will see no reason to suspect any health complaints related to your thyroid. However, you may have some very real symptoms such as a sluggish metabolism, weight gain, tiredness, difficulty sleeping, depression, and even infertility. Your doctor may tell you it's all in your head and prescribe anti-depressants or just tell you to eat less and exercise more! 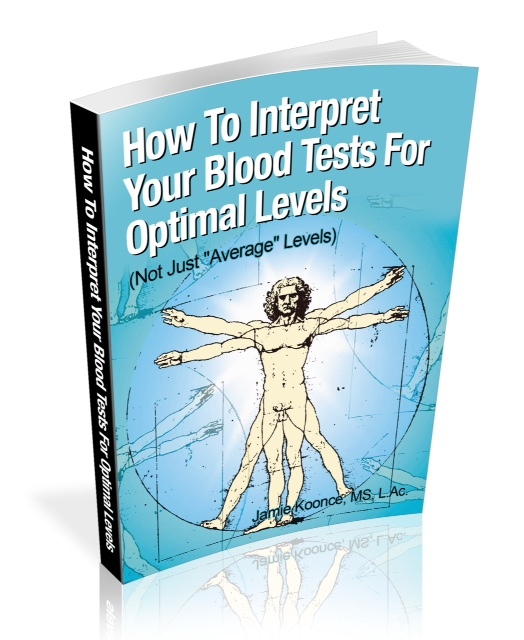 This e-book will help you better understand what the optimal levels for various blood tests are, and what it might mean if your levels are higher or lower than optimal. While this should not be construed as medical advice or a substitute for an appointment with your doctor, this e-book is a learning tool that can help you take control over your own health and learn more about what your body is telling you. Disclaimer: This ebook is not intended to serve as a substitute for professional medical advice. The information in this ebook is literally worth thousands of dollars because the information contained in it will empower you with the knowledge to take control of your health and detect any health imbalances that may have been overlooked by busy medical providers that may only glance at your lab test results for a few moments. Instead of comparing your test results to all individuals (healthy, sick, and in between) in the population, this ebook will help you compare your test results to healthy individuals in the population. It is not uncommon for some functional medicine doctors to charge $1,000 per hour for a consultation and review of your lab tests. You will have access to the same closely guarded information they use when you purchase this ebook. Instead of paying thousands for this information, you will only pay $19.99!